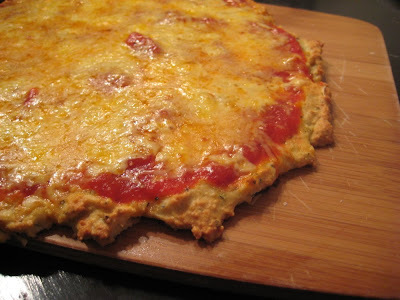 This recipe is adapted from "John's Pizza Recipe #2" in Breaking the Viscious Cycle. I found it very easy and simple to make and very satisfying as far as gluten free pizzas go. The edges got satisfyingly crispy, the bottom held up under the sauce and the overall flavor was very traditional- which is what I wanted! The following recipe makes one personal pizza. Mix ingredients for the crust and place the dough on a baking sheet or pizza pan covered in parchment paper or a silc pad. Spread the dough with a spatula until it forms a thin, even circle for your crust. Place in the oven and turn on to 350. This way the crust will be ready for toppings when the oven is preheated. When the oven has preheated, remove the pizza crust. Spread the marinara sauce evenly over the crust and top with the cheeses. Return to the oven and bake for 10-15 minutes.